20' Scissors Lift Details - Quasius Equipment, Inc. 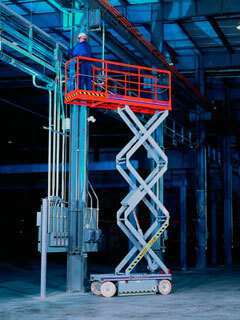 The Skyjack SJIII-3220 scissors lift is a self-propelled electric lift with a 20' maximum platform height and 26' working height. It's electric drive is capable of drivng up a 20% grade. Battery power means you are not tied to an electrical cord and no exhaust fumes are present. This unit is designed to be used on hard surfaced slabs and will not operate on gravel or over soil. The extendable deck extension adds another 3' of working space and allows deck extension over protruding objects. The unit is capable of full steering, lift, and drive operations while extended. Automatic pothole protection guides will extend when the platform is raised. The solid rubber tires are non-marring to minimize damage to finished floors. The 41" inside turn radius gives outstanding maneuverability in tight spots while the 79" collapsed height and 32" width make for easy passage through standard doorways. The platform is rated at a 750 lb capacity and is 32" wide by 84" long with the deck extension retracted. Power is provided to the platform through an imbedded power cord within the scissors frame rails. Safety harnesses are not required in these units but harness tie down rings are provided should you desire to use them. These units are low ground clearance and don't drive well up most trailer ramps so most generally we will have to deliver them on our hydraulic lift trailer. Contact us for delivery rates to your area. They may be picked up on customer's trailers as long as they are suitable for the task.